pinkpapercrowns: DCWV + May Arts Ribbon + Tombow Week! Hello and welcome to the DCWV/May Arts/Tombow Triple Threat Blog Hop! All this week, designers from these three great companies are sharing projects they created by teaming up some fun paper from DCWV’s Honey Chic stack, with a variety of adhesives from Tombow and some beautiful ribbon from May Arts. If you have come here from Jennie Garcia then you're on track! If not, you can go back to any of the company websites and start the hop from there! I'm SO excited to show you the layout I created for this hop! 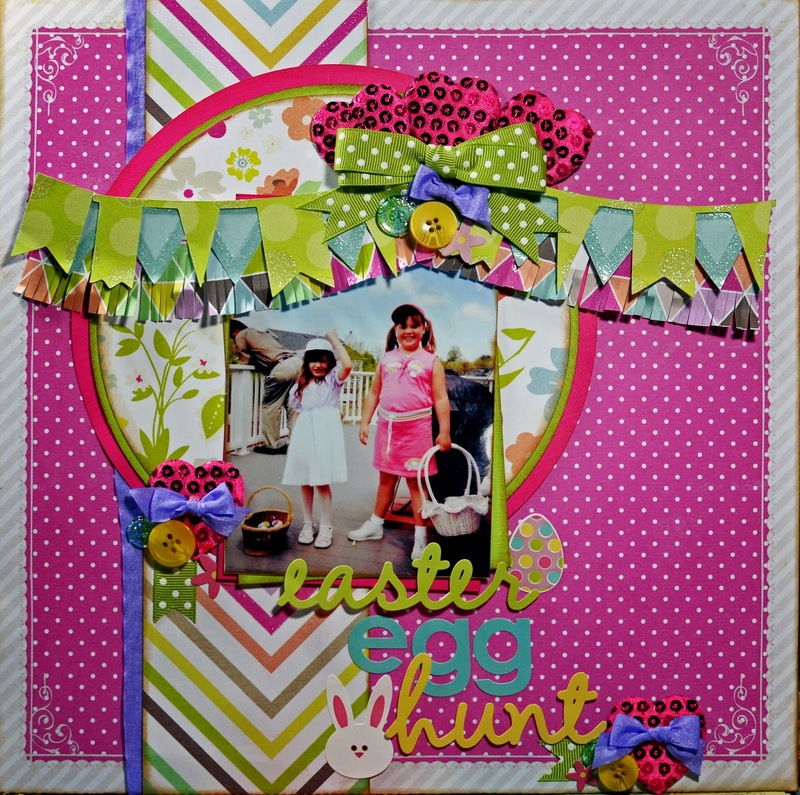 Even though this hop is happening during the summer I was really inspired to create this spring layout because I had this adorable photo of my nieces from an Easter Sunday many years ago. I loved the lush, bright and textural ribbons and trims from May Arts and I was simply IN LOVE with the string of sequin hearts! I decided that I would cut the hearts apart and then....I started making bows and I COULDN'T STOP! So, I added little bows to all my little hearts - which is a sentence I lived my whole life to say, lol! I love to add a strip of fringe-cut paper to my banners and it is SUPER important to have a strong adhesive for this technique - because the fringe needs to be manipulated a bit to get it to take on the same curve as the banners. I used the Tombow EXTREME! And it IS extremely strong! I loved how easy it went on and there really was a LOT on the roll. As always with Tombow, the dispenser is refillable and it feels nice in your hand. 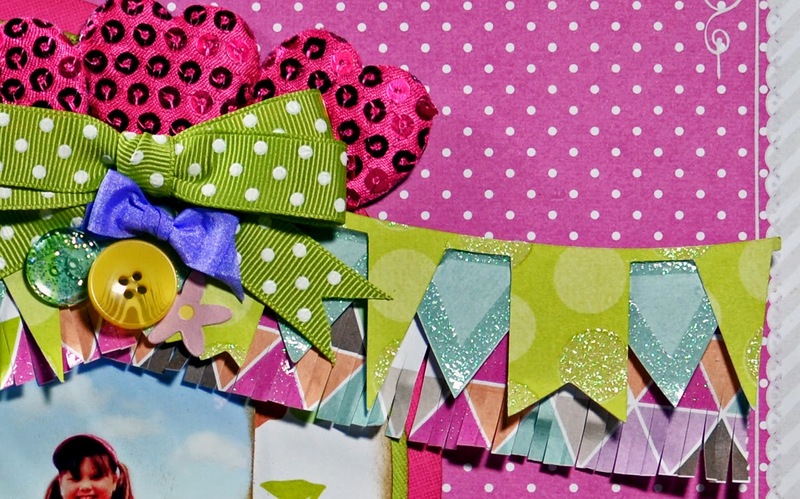 Then, I attached the whole, layered banner to the layout with some Power Tabs! Be sure to visit all the blogs today and leave comments for your chance to win some great prizes! 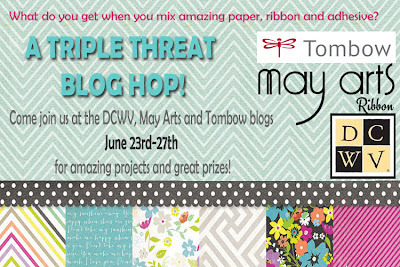 Three lucky readers will win a Triple Threat prize pack of you own, including a stack from DCWV, a spool of ribbon from May Arts and Xtreme Adhesive, Power Tabs, Removable Adhesive and Fastener Tabs from Tombow. Winners will be chosen from comments throughout the week, so make sure you check back daily to increase your chances of winning! Also, please make sure you have popped on over to Facebook and “liked” each of the company pages (DCWV / May Arts / Tombow), because really, what’s not to like?! Now, head on over to Amanda Phillips to see what kind of spring craftiness they have in store! Oohhh---Love the layout! That banner rocks! Lots of great colors and patterns--I like the banners. CUTE photo and SUPER CUTE layout Britt!!! What an awesome layout. Those colors are fantastic...so bright! What a beautiful layout! You have so many pretty elements and textures! The banners across the top are my favorite! Great page. Thanks for sharing. Your layout is such a bright and cheerful one! I love it! Beautiful layout, love the colors, papers and ribbons. This layout ROCKS! LOVE the ribbon banner and the Honey Chic paper is perfect for this photo!! TFS! Wow Britt, this is really great. Love all the layering on those banners. Really wonderful colors too. Love Easter!! I'm looking forward to trying your stronger adhesive product. Loved all the layered banners...very festive! Wow! Wow! Wow! So many things I love all on one page! Banners and hearts and bows and fringe oh my! Wonderful layout! So pretty and very creative. Love all the paper and ribbons. Thanks for the inspiration. What a bright and fun layout! Thanks for sharing! such bright and fun colors, great layout!!! Loven' the banner. Really cute layout, I love how bright and cheery it is! Wow, what a stunning layout! I love the vibrant colors and the banners. Fabulous layout, the colors are so rich and it looks like it needs to be touched. I like the mix of colors and textures. The banners and the fringe are so cute! The banners and the fringe are so cute! What a great combination of colors. Beautiful and detailed work! The banner is amazing! Beautiful project with great new to me techniques! Thank you for taking the time to craft and share with us hoppers! Such a cute layout. Love all the colors and the different papers and elements you used on this. I too love those sequined hearts and the fact that you can cut them apart and use them singly is a real bonus. Thanks for sharing. Such a fabulous LO Britt! I love the bright, cheerful feeling this evokes! You've showcased the products all so beautifully! Thanks for the great inspiration! Britt you always do such a fabulous job! Love your bright and cheery layout! And your nieces are adorable!